A Barre Chord is a chord where one finger holds down more than one string of a chord. The most common type of barre chord has the first finger holding down (or barring across) all six strings. Since you are holding down all of the strings, the barre chord shape is moveable, enabling you to play 12 chords of the same type (major, minor, 7th, etc.) by simply moving one chord shape up and down the fretboard. Let’s look at an example of how this works. Don’t try playing these examples yet, you will try playing a barre chord after I explain how barre chords work. 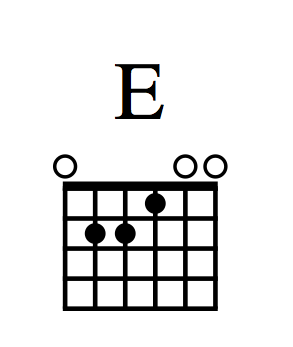 Begin with an open E (Major) chord, a chord shape you already know. Move this shape up one more fret and you get an F sharp (or G flat) chord. Move the chord shape up one more fret and you have a G chord. Notice the number and letters “3fr” next to the chord diagram. They tell you that the top of the chord diagram is starting at the 3rd fret. Each fret you move up the fretboard is one more half step up the Chromatic scale (the 12 notes in an octave.) So by learning this one major barre chord shape, you can play 12 major chords by simply moving the shape up or down the fretboard. For most chord types, you will be learning two barre chord shapes. One chord shape that has its root note on the 6th string, and one chord shape that has its root note on the 5th string. Knowing two barre chord shapes for each chord type gives you more options when deciding where to play chords. Learning to play barre chords is another hurdle guitarists must jump. It is difficult at first, but so were open chords — remember? Patience and lots of practice are the keys to mastering barre chords. 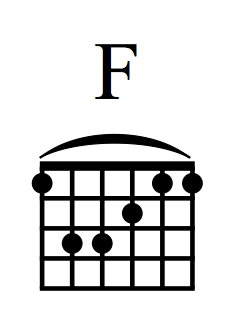 Let's begin with the major chord shape at the 5th fret. We are starting at the 5th fret because the string tension is less there than near the nut. So for your first attempt at barre chords it is easier and less discouraging to begin higher up the neck. Start by placing your 1st finger across all six strings at the 5th fret and holding them down. You don’t have to squeeze hard. Just put enough pressure on them to hold them down against the fret. Then place your 3rd finger on the 5th string at the 7th fret, your 4th finger on the 4th string at the 7th fret, and your 2nd finger on the 3rd string at the 6th fret. Now try strumming the chord. Keep adjusting your fingers until you can strum the chord cleanly. This is an A Major barre chord. If you are having trouble with this method, try the alternate method in the “Tips For Playing Barre Chords” section below the chord exercise. Once you can play this major chord shape cleanly, try the following exercise. Notice you have to slightly adjust your fingers as you move up and down the neck because the fret spacing is different depending on where you play. One common mistake people make when trying barre chords is many squeezing the neck of the guitar too hard. This causes their hand to quickly cramp, and they give up too soon. You simply have to hold the strings against the fret with enough pressure for them to ring clearly. And you 1st finger only needs to barre the strings that your other fingers aren't playing, so you don't need a "vise grip" on the neck with the 1st finger. Another common barre chord learning mistake is locking your 1st finger across the strings in a way that makes it hard to put your other fingers on the the rest of the chord. At the 5th fret (string tension is much less farther up the neck than near the nut, and the frets are still fairly far apart, so it is a good place to practice barre chords) try an A Major barre chord. But don't start with the barre (1st) finger. Start with the other fingers of the chord first. Then once you have them in place, play each string and see if all the notes are clear. If not adjust them until they are. Then simply lay your 1st finger across all the strings where it naturally falls, it doesn't have to be straight, and it can extend over the top of the neck. Then just apply pressure until all the string sound clearly. Once you can play one cleanly, start moving the shape up and down the neck one fret at a time covering the 1st through the 9th fret. The lower frets will be the hardest, and you have to constantly adjust for fret spacing as you go up. You probably won't ever play a barre chord beyond the 9th fret on acoustic (unless you are using a capo really high up the neck.) and rarely on electric. String gauges are heavier on acoustic guitars than electric guitars making them harder to play barre chords on. But barre chords are certainly do-able on acoustic with practice. And very useful. It will take lots of practice just like any new chord. Don't give up. Persistence and repetition is the key to learning anything. And remember playing all barre chords will make your hand cramp eventually. Much faster on acoustic. So try to use them sparingly. Or break them up with open chords. And if your hand cramps when practicing. Take a rest. You don't want to harm any muscles in your hand. Next time we will look at the 5th string root Major barre chord.